It is said that a lot of Sichuan people came to Xinjiang for making a living. Many of them engaged in manual labor and required economical meals to support their hard work. After researching, the "Big Plate Chicken" finally appeared. Since the process of cooking “Big Plate Chicken” is simple and the materials are common. This dish soon became popular. It can say that “where there are Muslim restaurants, where there is Big Plate Chicken”. In a certain sense, the Big Plate Chicken is the product of national unity. It has chicken nuggets as well as vegetables. In taste, there is spicy that Xinjiang people like and hemp that Sichuan people fascinate. Mention to Halal food, Sautéed Lamb Slices with Scallion is an indispensable dish. The major materials of Sautéed Lamb Slices with Scallion are mutton, egg and scallion. The materials are nourishing and easy to get. Sautéed Lamb Slices with Scallion is a best choice for dinner, especially in winter. Sautéed Lamb Slices with Scallion is good for the people’s health and help to nurse one’s body. But to cook an authentic Sautéed Lamb Slices with Scallion is not easy; it has very strict control on fire. 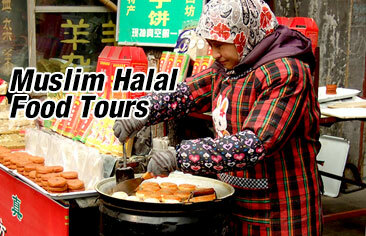 To try the delicious food, going to Halal food restaurants can meet your demand for the yummy dish. 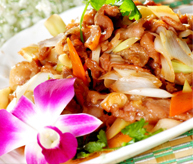 Kebab originated from the Uyghur and become a popular dish in Chinese Islamic cuisine. The dish has since spread across the rest of the country and become a popular street food. 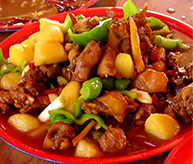 People uses lamb, mutton, chicken, beef and seafood (Muslims do not eat pork) as materials. 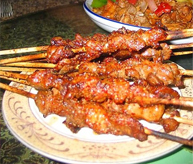 Small pieces of meat are skewered and either roasted or deep-fried. Common spices and condiments include cumin, pepper, sesame and sesame oil. Kebab is said a traditional food of the ancient northern nomadic people. Because kebab is easy to make, it is very popular. In the past, nomadic people were poor; kebab has brought them satiation and helped them through the hard time. Therefore, in the Muslims’ heart, kebab is special and important. Lamian is a Chinese dish of hand-made noodles, usually served in a beef or mutton-flavored soup, but sometimes stir-fried and served with a tomato-based sauce. The hand-making process involves taking a lump of dough and repeatedly stretching it to produce a single very long noodle. Many of the lamian restaurants are owned by Hui ethnic families from Northwestern China, and serve only Halal food (thus no pork dishes). Lamian restaurants are the most common halal restaurants in eastern China. 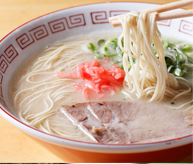 Lamian is a kind of flavor food and has a special meaning to the Muslims. Almost all of the Muslim restaurants have Lamian. Soup is the key part of Lianmian. The authentic soup is fresh and full bodied. 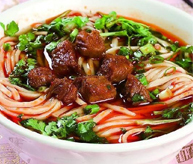 Beef noodle soup is a Chinese noodle soup made of stewed or red braised beef, beef broth, vegetables and Chinese noodles. Stewed beef noodle soup was first created by the Hui people during the Tang Dynasty. The Chinese Muslim style of beef noodles is also known as clear-broth or consommé stewed beef noodles. It often uses halal meat and contains no soy sauce, resulting in more taste of the beef in the soup. Salt, red chilies, star anise, white pepper, and green onions are used to add flavoring to the soup. In halal restaurants, only quality local beef from the Taiwanese zebu prepared by the local halal butcher is used for the beef noodles. Beef noodle soup is a common food to the Muslims. 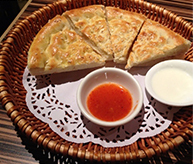 Nang is a type of round unleavened bread, topped with sesame. Nang has many good characteristics, such as easy to make, easy to carry, long storage time and suitable for journey. Therefore it is the best choice for the businessmen and travelers. Nang is one of the major pasta that Xinjiang people like. Nang has a long history of over two thousand years. It has more than fifty kinds. They are all make of flour and saline water. In Uyghur, there is a saying that: people can live a day without food, but can’t without Nang. It is enough to prove that Nang is important in Uyghur people’s life.